WE ARE a society of consumers. All things being equal, each of us has personal or professional interests that motivate us. In an era of high tech and low touch, we are consuming products, services and information at an exponential rate. Attending expositions or industry trade shows is an excellent way for you or your team to gain new knowledge, meet industry experts and learn about leading-edge developments in almost any industry or trade. Attending product shows and expos stimulates creativity. Delegates and attendees learn first-hand about new innovations at conference venues, hotels or convention centres with high value on learning and low pressure to buy. Confirm your reservation or attendance with the organisers. By registering, you will receive advance information and your name badge will be waiting for you. Research. Review the listing of companies showcasing or the conference sponsors involved. Make the most of your time by meeting with them one-to-one at their booth versus wandering around the tradeshow or venue halls. Learn and meet. List who you want to see and any products or services you are interested in. Find out if there will be educational forums, seminars, breakout sessions, early bird breakfasts or lunches offered for you to attend. Arrive early. Avoid the crowds. Move through the site of the show quickly and see as many exhibitors as possible on the first day when exhibitors are fresh. Arrange one-to-one meetings with managers or suppliers. 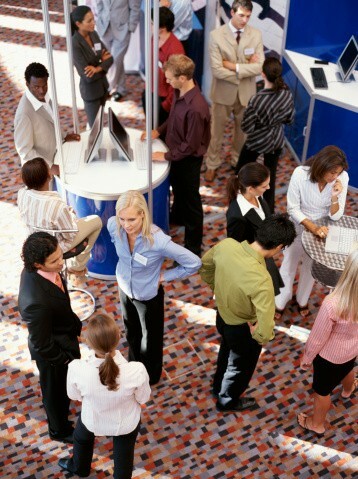 Ask good open questions about what they are doing at the tradeshow or expo. Content is king. Gather information and resources. Find out what new products and services are available to help you grow your business or increase productivity, profitability and alliances in your profession. Network. Talk to show managers, association executives, seminar leaders, industry experts for awareness and perspectives on trends and services. Contact. Your badge may introduce you; however a contact or business card will ensure (if you want) that the vendors contact you via e-mail or a phone call. Follow up. Contact those you met or found an affinity with. The expense of tradeshows and expos are always being judged by the vendors. They will continue to participate when they see a return on their investment. “KIT”. Keep in touch with tradeshow exhibitors or organisers. Let them know that you appreciated their efforts with an e-mail message or a phone call if relevant. Alliances. Where an opportunity presents itself, a strategic alliance, new agency or partnership can be a win-win in your future. Make a date with yourself over a cup of coffee or tea and note some of the main things you learnt from attending the trade show or people you met at the expo. Attending trade shows and expos can be an excellent way to leverage your time and power up your learning and earning curve. In a worst-case scenario, you will be walking around for a few hours meeting decision-makers one-on-one in a high-energy environment as a consumer or potential buyer.